Miracle on 34th Street. Elf. Home Alone II. 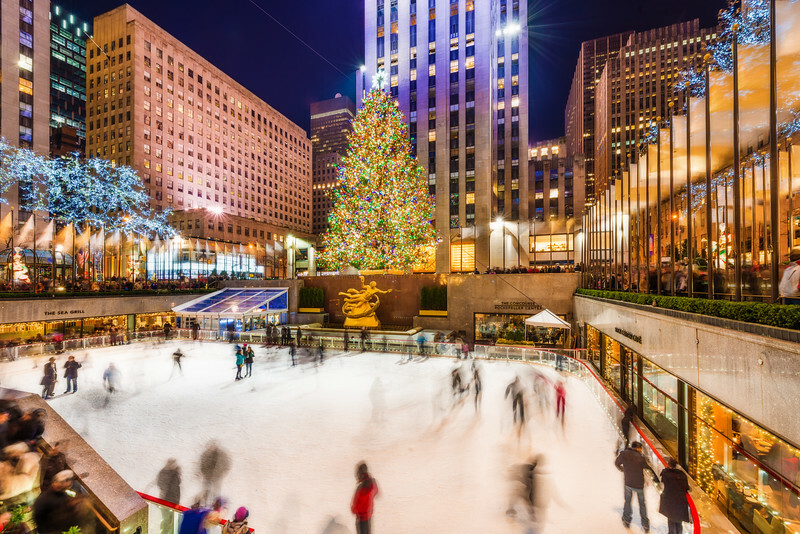 New York City has been the setting of numerous memorable (well, maybe not the last one) Christmas films and television specials, and for good reason: the city comes alive during the holiday season. New York City always has a frenetic energy, but the falling temperatures and snow bring a certain calm and festive atmosphere. This distinct energy is palpable and infectious; you truly don’t mind walking two miles in the blizzard to see all of the lavishly decorated store windows, and even do so with a smile on your face. For me, nothing beats a Christmas evening in Rockefeller Center just soaking up the atmosphere. The glow of the Christmas tree, sounds of happy crowds in the plaza, ice skaters circling in the rink below, and the crisp New York winter air. It’s almost like Charlie Brown: New York Edition. I ate up this ambiance, and spent hours (plural) standing around doing mostly nothing. Don’t plan on ice skating here. I sort of wanted to do this prior to my visit, but had been given the heads up not to from a friend before the visit. They were right. I visited Rockefeller Center a few times while in New York City for Christmas, and each time, the line was insane. This included one particularly frigid weekend evening when the snow was really coming down and the wait was estimated to be around 2 hours. I guess if you make the trip all the way to NYC and have your heart set on skating, you’re going to do it no matter the weather…so the lesson to be learned is don’t have your heart set on skating. The major New York City retailers–Macy’s, Bloomingdales, Saks, etc–all put up beautifully designed window displays for window-shopping tourists who will probably never step foot in their stores and instead do all of their shopping on Amazon. It’s great! These aren’t your average window displays; they are productions. Almost all of them move, some feature sound, and almost all progress as vignettes in a linear story. To see all of the windows, you’re looking at a 2-mile stroll, which actually isn’t as bad as it sounds, and since most of the walk is down Fifth Avenue, this makes a great way to see New York City during the holidays (take a diversion down a side-street for lunch at a hole-in-the-wall spot). Here’s a map of the self-guided New York City Christmas window walking tour. I recommend starting at Macy’s and ending at Bloomingdales, as this way you can start out your day at Santaland, discussed below. Had I gotten my act together and written this last year, that would have been “shop at FAO Schwartz.” Unfortunately, that closed in July, so no longer can you do your best Tom Hanks impression and dance on the giant piano. Too bad, it was a really cool store, and great excuse for adults to look at toys. Albeit not as cool in my opinion, Macy’s is still a good place to actually visit, and this store certainly has iconic status in terms of New York City Christmas locales. Getting to Santaland requires walking a labyrinth of other displays in the store, but it’s a pretty cool area of the store. Just don’t get your expectations too high or wait too long, as it’s not that cool. This one is sort of cheating. The serious recommendation would be to see the Rockettes perform in the Radio City Christmas Spectacular. That’s not exactly a cheap ticket, though. If you’re serious about Christmas and have wanted to see the Rockettes perform since watching the Macy’s Thanksgiving Day Parade as a child, by all means go. The show has received technological updates in recent years to stay relevant, so it’s not simply resting on the laurels of the reputation the Rockettes built decades ago. Even if you’re not going to see the show, Radio City remains a must-visit destination. The building itself is a magnificent, historical destination, and it’s interesting to explore. Moreso than any other major city I’ve visited, New York City is bursting with Christmas decorations. From oversized ornaments in public plazas to beautiful trees and garland in the library, there’s an abundance of Christmas spirit virtually everywhere. For the most part, these other places are spots you’ll want to visit anyway or at least wander past as you tour New York City. I can’t say there’s anything I’d make a separate side trip to go see–you certainly don’t want to trudge 20 blocks through the snow, uphill both ways, to simply see some building with a giant bow tie on it. You’ll see plenty along the way, and there are a lot of Christmas decorations with neat “diversion” status. A Christmas-centric weekend in New York City is entirely possible, and will probably cover most of the items on this list, plus some additional stuff. There’s no shortage of Christmas entertainment to enjoy. From SantaCon to finding the best Christmas cookies in the city (my very unscientific pick based on the internet was Levain Bakery, where I waited in like for about 30 minutes at 8 am! 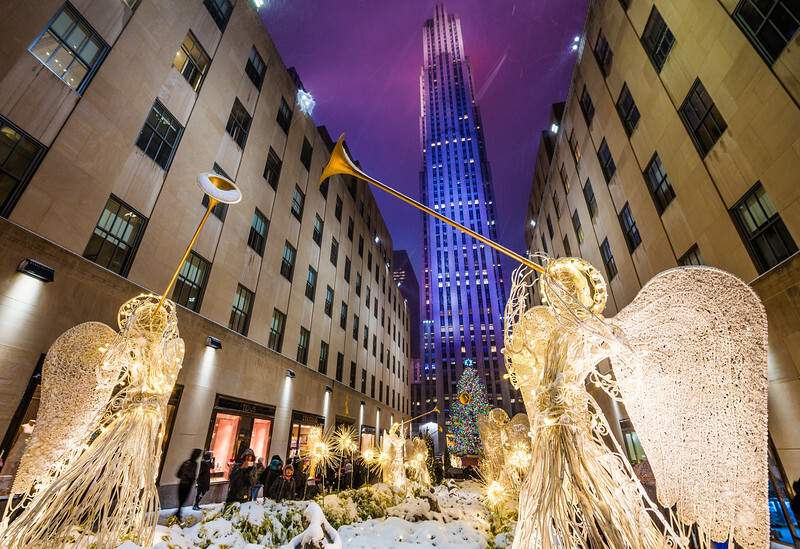 ), there’s a multitude of ways to get in a festive spirit while visiting New York. To get some more New York City photo ideas, check out my New York City Photo Gallery. For photo licensing inquires, please contact me. If you enjoyed this post, please use the sharing buttons above to help spread the word via social media. I greatly appreciate it! What city that you’ve visited do you think best captures the feel of Christmas? 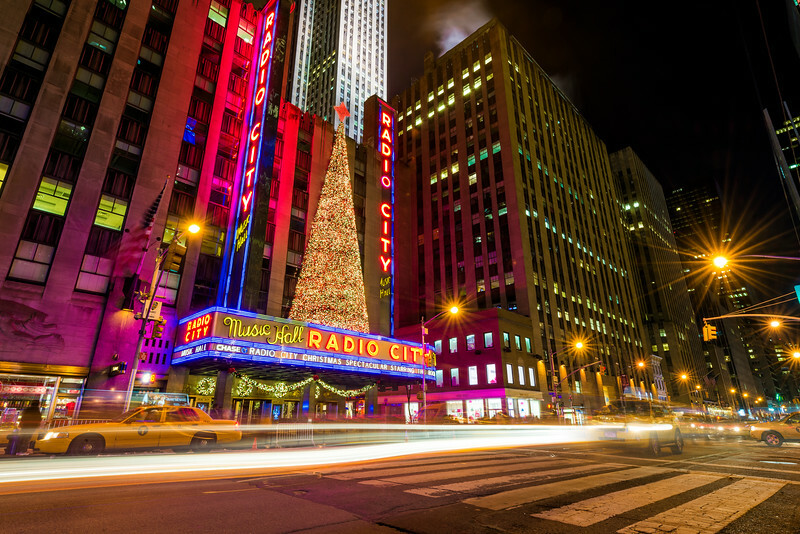 Have you seen the Radio City Christmas Spectacular, or other Christmas entertainment in NYC? 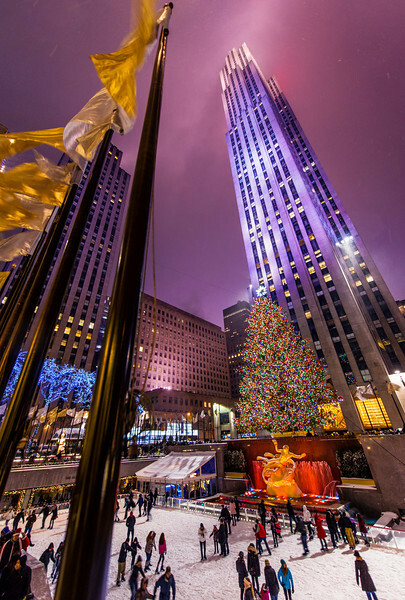 What do you think of Rockefeller Center at Christmas or the store window displays? Share any thoughts you have in the comments! Tom, I think you nailed it! These are probably the best spots to enjoy the christmas season in the city. I absolutely love just spending time around the “Rock” and soaking it all in. Just do your best to overlook all the crowds and you can have a great time! Your comment about jumping off the main avenues to grab a bite to eat is spot on. There are so many great restaurants to try for just about any taste. Although not just for Christmas, if you have time I would recommend heading to the Top of the Rock as well for some great views, especially at night. In my opinion, the views from there trump the empire state building and are also about half the price. NYC is certainly not my favorite city in the world but I do enjoy visiting there about once a season as they tend to have something different for each one, especially at Christmas. Happy Holidays! There’s an app called TodayTix that had broadway show tickets for a discount for the coming week or so, like the Hotels tonight app. They have tickets for the Radio City Christmas Spectacular for as low as $23 if you can go on week nights. Thank you, Lauren, I’ll have to watch that app for nights we’d be available. I had looked at tickets but the standard ones are very spendy and I didn’t feel like doing the TKTS lines. This looks like a good happy medium! My wife and I are heading to NYC for the first time in just over a week. I’ve been waiting for this post since you mentioned it in your email newsletter. Can you elaborate on exploring Radio City Music Hall? The only thing I’m seeing are paid tours, which it doesn’t sound like is what you mean. We had only planned on walking by it to see what you show in the picture, but if there is more to do we could certainly fit it in.